​Raffle: Burt Chortkoff brought a $40 gift certificate to Fresco North and a bottle of Elvis wine. ​We are looking into how to help Colorado during this difficult time. 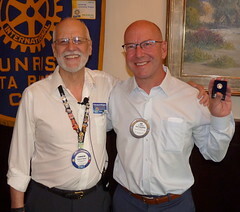 Jim Ruh is contacting the Rotary Club of Denver. There is a Board meeting directly after this regular meeting. ​Dana Goba: Attend grant classes for 2014-15. Claude Saks presented checks to the club foundation from sponsorships to the Fiddlers’ Festival. Gary Jensen announced that each member was given an envelope with 10 tickets to Fiddlers’ Festival and is asked to sell them. He personally paid for $2 of each ticket he sold to friends to give them an incentive to purchase from him. You could also find someone to sponsor a prize, sponsor a ground sign, put an ad in the program or other ways to raise $200 for the event. Andy Doerr announced that he’s still looking for volunteers for the weekend. People can earn a free pass to the festival if they volunteer for 3 hours. Spread the word. This event qualifies for high school students who need volunteer hours. Andy will send more information via email. Tickets are $20. Tickets for seniors are $15. Please interact with the Fiddlers’ Festival on Facebook. No club meeting the week after Fiddlers’. Getting To Know You with David Vo. What college did you attend and why did you choose that college? He attended UC Santa Barbara because he wanted to go to a UC, and it was far enough that his parents couldn’t easily drop by, but it was close enough that he could get to them in case of an emergency. He graduated with a business econ degree. 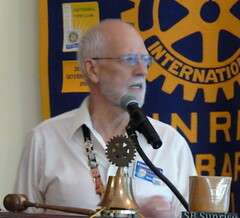 Bruce Belfiore read the Rotary Minute about polio immunizations. ​Raffle Results: Sandra O’Meara won. ​​Pay & Tell with Sgt at Arms Andrew Chung. The ad hoc fundraising committee had a good meeting on Monday. Program: Betsy Munroe introduced District 5240 Governor Jack McClenahan. Intro: Jack has a very impressive resume. Through lots of travel, he and Jane know people from nearly every club, but none have as many people and friends as the SB Sunrise Club. He taught football and track at St. Mary’s College in Berkeley. The freshmen students had never played before so it was a challenge just getting them on the field and pointing in the right direction. He and Jane have been involved in the Rose Parade float committee for a number of years. The District 5240 Float Rider this year will be Luz Marie Ortiz-Smith. His first convention was Munich in 1987. 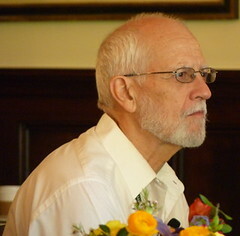 He was the president of the Rotary Club of Ojai. Turned out to be one of the most important meetings due to two topics on the agenda – women in Rotary and Polio Eradication. The Supreme Court handed down the decision regarding women in Rotary. That year, the Rotary Club of Duarte inducted a woman in defiance of the rules. They continued to meet as the “Ex Rotary Club of Duarte.” They sued RI, and the Court ruled it was a business organization. A year and a half later it became official in Rotary. Different clubs handled the decision in different ways. Between 1987 and 1990, more than 20,000 came into Rotary. In this district, women make up about 30% of the membership. Help recruit well qualified women into Rotary. Women brought new perspectives and opinions. Their new ideas get incorporated into existing programs or they introduce entirely new ideas. For example, Stephanie, a member in his club, proposed the idea of doing CERT training. The club ended up producing a video for community emergency training. Women bring ideas of unmet needs of the community. As a result, the service programs improve. 1987, they announced the Polio Eradication fundraiser drive. RI doesn’t fundraise centrally. In an unusual move, Polio assigned each club a goal. The goal was $140 M and they didn’t think they could do it, but the next year in Philadelphia, they announced they raised much more. Paul Harris Fellows used to be honorary, and it was considered tacky to donate $1,000 to give yourself an award, but the attitudes changed and it became accepted to donate for a PHF. The attitudes about donations changed. The types of grants changed, for larger amounts. There wasn’t growth in the number of countries that were endemic to Polio. That was going the other direction. The number of countries with Polio dropped over the years. If you go to polioeradication.org, you can see exact statistics. The last case in Afghanistan was July 23rd. Pakistan had 28 cases this year. August 19th was the last case there. We are keeping an eye on that to see if it changes. Pakistan is a tough country to do eradication in. Their government is really committed to this because their rival India is Polio free and they don’t want to be beat. The bad news – Somalia has 163 cases due to this summer outbreak. They previously didn’t have any cases. In the spring there was an international conference where health agencies announced a world polio emergency. Different countries made commitments (ie Australia gave $150M). Hopefully we have no more cases by the end of 2014. The chairman of the Gates Foundation announced a new challenge. If Rotarians give $35M, they will match it two for one. They’ll do this for five years. They have already given half a billion dollars. We hope to declare victory in 2018. We have decided to set a district goal of $350k which is 1% of the goal. We know we can do this because our district raised $1.3M in 1987. Caution against moving annual fund money into the Polio fund. Talk about our Foundation Gala. We are going to do four, one in each region. It’ll be a celebration of a quarter century of women in Rotary. Regional committees will need to be formed. Will be a focus on Polio eradication. In appreciation of the speaker, it is the Club’s practice to donate 15 dictionaries to local 3rd graders in his honor. Next Week’s Program: E Russell Smith will talk on how the Affordable Care Act/Obamacare will effect California, should be an interesting talk. that is also happening witth this article which I am reading at this time.